There’s no doubt that today’s consumers are highly tech savvy and dependent on their mobile devices to perform many of their day to day activities – including paying bills. According to Forbes, the use of mobile devices to make payments has tripled since 2012 and should increase 48% by 2017. More than 1.5 billion people are expected to adopt internet connected mobile devices and at least 50% of them are already comfortable with using their device to make payments. FTNI’s ETran Mobile solution, built on the ETran receivables platform, helps you unlock the power of mobile payments with the strategic goal of simplifying all your receivables to process and post from a single platform. 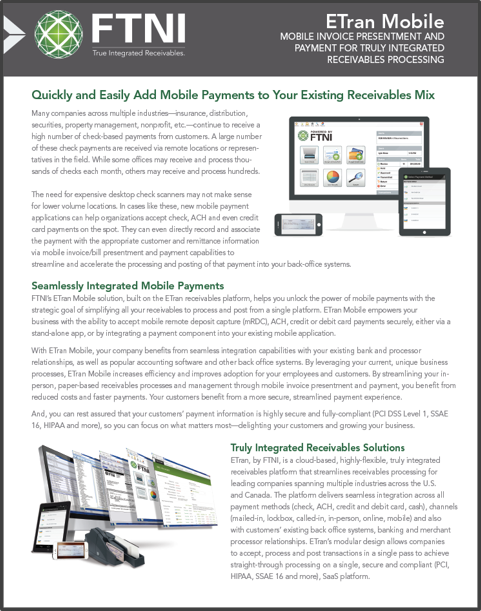 ETran Mobile empowers your business with the ability to accept mobile remote deposit capture (mRDC), ACH, credit or debit card payments securely, either via a stand-alone app, or by integrating a payment component into your existing mobile application. Learn more about ETran Mobile by downloading the data sheet now.